The positive risk sentiment from Friday continued to ease slightly on Tuesday as investors preferred to err on the side of caution ahead of potentially market-moving economic releases starting today. UK employment and US industrial production numbers will be the main highlights. But the ZEW economic sentiment out of Germany will be closely watched too for signs that conditions in the Eurozone’s powerhouse economy are improving. The euro has recovered to around the $1.13 level as some of the pessimism surrounding the Eurozone economy has receded and could extend its gains if the incoming data this week point to a possible rebound. But the same might not be true for sterling as the cost of the prolonged period of Brexit uncertainty may have already done more damage to the British economy than what many traders have priced in. So even in the absence of Brexit headlines, the pound may lose ground if new data diminish the odds of a Bank of England rate hike. 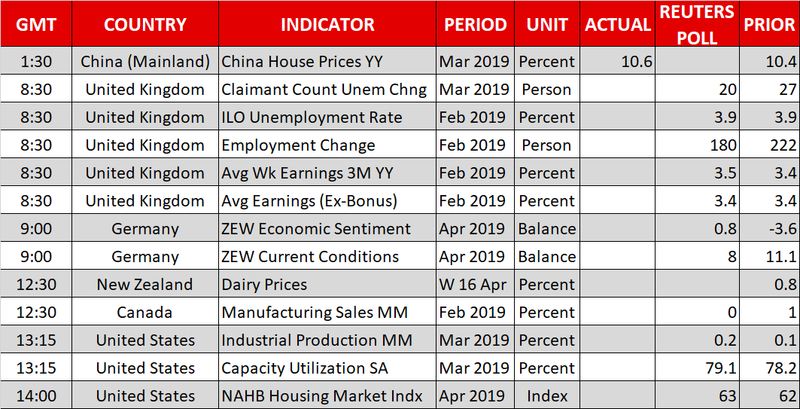 As for the US dollar, solid economic indicators may provide support at best should the improving risk appetite continue to dent demand for safe haven assets. 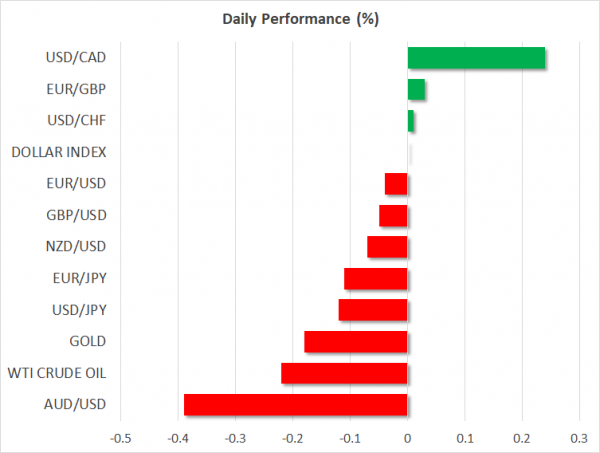 The greenback was off recent two-week lows against basket of currencies on Tuesday, while versus the yen, it was trading slightly below the 112 level. China will publish first quarter GDP growth figures on Wednesday, along with monthly industrial output and retail sales numbers. 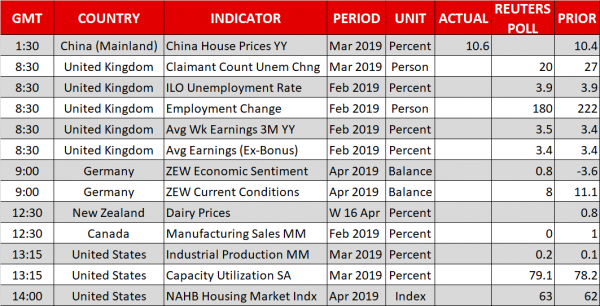 Investors are hoping to find more evidence of a turnaround in the Chinese economy from the data, which will likely set the market tone in the near term. Sentiment was lifted on Friday from encouraging trade and credit growth data, with positive trade headlines further boosting risk appetite. However, even as trade talks between the US and China appear to be nearing their conclusion, markets may be underestimating the risk of more trade tensions, this time with Japan and the European Union. Japan’s economy minister held preparatory talks with the US Trade Representative Robert Lighthizer on Monday, saying the discussions were “frank and good”. While it may be too early to speculate whether the US would end up imposing tariffs on Japanese and European products, markets are, for now at least, not too concerned about such prospects. Instead, much of the focus this week is on the US earnings season. After getting off to a positive start on Friday, there was some disappointment yesterday from banks earnings. Goldman Sachs missed its earnings estimates and saw its stock falling by almost 4%. As a result, the S&P 500 was unable to break above its all-time high and closed slightly lower at 2905.58 (-0.1%). But that didn’t stop Asian bourses from posting strong gains on Tuesday and European indices were also headed for a positive day. The risk-on mood wasn’t of much help for the Australian dollar, which is underperforming its peers today. The aussie tumbled by about 0.5% after the minutes of the RBA’s April policy meeting revealed significant alterations to policymakers’ language and their discussions. The RBA signalled that if “inflation did not move any higher and unemployment trended up” than a rate cut would be “appropriate”. The aussie last stood at $0.7146, while the kiwi was also trading lower at $0.6754 following some dovish remarks by the Reserve Bank of New Zealand’s governor, Adrian Orr, earlier today. The kiwi will likely remain in focus as the latest bi-weekly dairy auction is due later today and first quarter inflation numbers out of New Zealand will be published at 22:45 GMT. Meanwhile, in commodities, oil prices were steadier following Monday’s sharp losses on reports that Russia could soon begin raising its oil production. WTI was marginally higher at $63.42 a barrel. Are We Gitting an Earnings Recession?